On April 22, we will celebrate International Earth Day in Costa Rica with a special festival in Barrio Amón. This unique event includes workshops and exhibitions, yoga and dance classes, live music and soundscapes, a local farmer and artisan market, food trucks and lots of good vibes. Earth Day is a worldwide activity to raise consciousness about the planet’s diversity and threats, it is orchestrated through the Earth Day Network. The Costa Rican chapter is organized by A 01 in collaboration with Amón Solar. All profits from this event will go to the Chira Project, a multistakeholder approach for rural development in Costa Rica. As a first physical intervention of the Chira Project, the Recycling and Community Center of Chira will be built. The RCCC is a long-term project, considering both the required construction of infrastructure (or “hardware” as we tend to refer to it), as well as a sensibilization of the local culture (or “software”) to use the built interventions in the best way possible. Although Costa Rica is globally known for its achievements in sustainable development, the country is poorly organized in terms of its waste management. Rural areas in particular suffer from this situation, which can hinder economic development and threatens the environment. Chira is located in the Gulf of Nicoya; the island has no garbage collection whatsoever. The inhabitants burn or bury their waste or simply throw it into the sea, thus endangering their own livelihood: the population of approximately 3,000 people traditionally lives from fishing. The framework of the RCCC and the Chira Project intends to tackle the waste management issue and at the same time create resilience through a diversified economy including community based tourism and the artisan production of upcycled goods. The RCCC will be run by the Association of Women Working for the Environment (ADATA, according to its Spanish abbreviation). The members of ADATA were involved in all stages of the participatory project design. Moreover, they will be trained to organize waste management on the island and to apply the gained knowledge for the sake of the socio-economic and environmental development of the island. Through a series of courses for environmental education, ADATA will educate their fellow islanders on how to manage and, above all, avoid waste for the wellbeing of the community and the environment. In order to enable this process, a series of actors is involved in the overall development plan, including national and international universities and institutions, the Ministry of Labor and Social Security, the Costa Rican Fab Lab and private investors, as well as the United Nations Development Programme. The bioclimatic design of the RCCC, which was exhibited at the renowned Architecture Biennale of Venice in 2016, is composed from a toolbox that has been developed by A 01 for different types of recycling centers in Costa Rica. Based on the local requirements, Chira serves as a first case study site. Due to its educational mandate, the project goes beyond the typical spatial requirements of a recycling center. Apart from the obligatory work areas, social spaces are accounted for in order to house the educational activities and local cultural expressions. In daytime, a series of diversified activities unfold around the central service core of the building. At night, the core can be closed to secure all machinery and valuables. The multifunctional RCCC combines traditional ways of living with modern building techniques, including the use of recyclables, renewable energies, and rainwater recollection. Local woods are used to contribute to the island’s economy, wastewater is biologically treated on site, an edible garden provides food for the managing staff and their families. 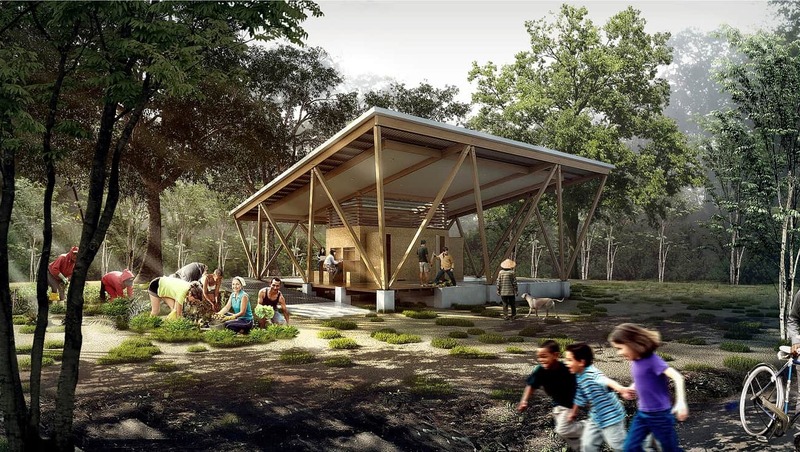 The Recycling and Community Center blends with its natural surrounding; it intends to set a good example for the island and the country at large. After laying the foundations of the project in 2014, the construction was paused for some time in order to raise more funding and to optimize certain aspects of the design. In the meantime, a small laboratory for digital fabrication (Fab Lab) was included in the overall building layout and operations to support the making of upcycled goods as well as the process of environmental education. Also, a series of additional academic partnerships have been created with Veritas University from Costa Rica, the Prairie View Texas A&M University and their Community Development Studio, as well as the HafenCity University in Hamburg and their master programme in Resource Efficiency in Architecture and Planning (REAP). These partnerships add on to the quality and educational value of the long-term Chira Project. In the long run, the Chira Project proposes to implement different types of small-scale projects or “rural acupunctures” all over the island in order to stimulate an integral sustainable development with a focus on local economic development, social cohesion and environmental education. For more information on A 01’s Earth Day celebration, visit the event’s Facebook page.